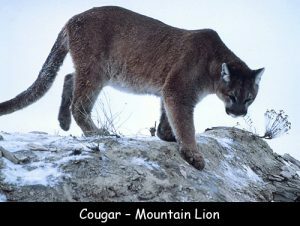 A cougar is also known by different other names including mountain lion, puma, panther, catamount etc. They are native to Washington State. They are also the most widely distributed land mammal in the Western hemisphere. Their scientific name is Puma Concolor. They are more closely related to domestic cats as opposed to the members of the Big Cat Family. These solitary animals are most active during dawn and dusk. They prefer making their dens in rocky ledges, dense thickets and under uprooted trees and are highly territorial. The average lifespan of a cougar is 10 to 12 years in the wild and about 20 years in captivity. These carnivorous animals can feed upon everything from mice to deer, horses to domestic cattle etc. They will also attack / prey on humans in rare cases. They have large front paws with a long tail that helps them to balance their bodies easily. Cougars have a field of vision spanning 130 degrees and an average sprinting speed of 56 kilometers an hour. They can run as fast as 55 to 72 kilometers per hour while chasing their prey. From a sitting position they can jump to a height of 18 feet and leap up to 40 feet horizontally. They start breeding after reaching the age of 3 years. After a gestation period of 3 months, they can give birth to 1 to 6 kittens. The kittens (also known as cubs) are generally born with blue eyes and the color changes to greenish-yellow in about 16 months. They are not considered as one of the big cats because they cannot roar at all, however they are physically large predators. Declan, Tobin. " Cougar Fun Facts for Kids ." Easy Science for Kids, Apr 2019. Web. 25 Apr 2019. < https://easyscienceforkids.com/cougar-facts/ >.